Phoenix AZ IRS tax attorney or not? 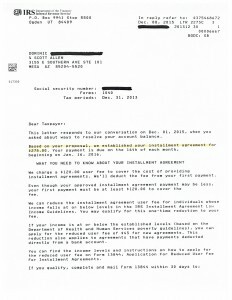 - Tax Debt Advisors Inc.
Did Dominic use a Phoenix AZ IRS tax attorney or an Enrolled Agent? When faced with an IRS problem a taxpayer is faced with several different options. First, how to begin? Where to start? Who is out there to hire? When first getting started to resolve an IRS matter its important to do so with 100% commitment. If you are not you will only make the matter worse by beginning and not finishing. In seeing that process to competition its important to hire the right person who will take the time and skills to get that done. Scott Allen EA of Tax Debt Advisors knows what needs to be done to make that happen. 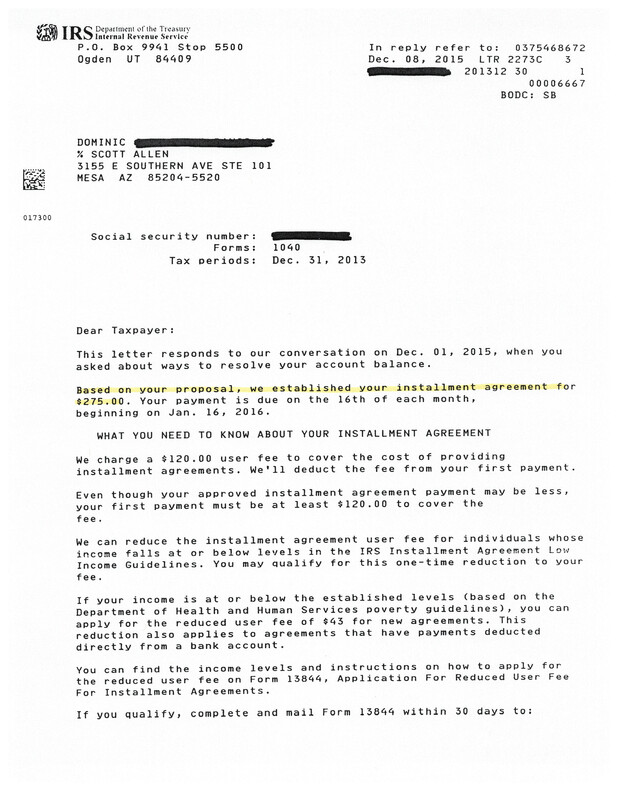 As you can view in the notice below he was able to aggressively negotiate an IRS payment plan for his client to stop the wage garnishment. Scott Allen EA would like you to consider him to be your first voice before the IRS. He can be your IRS power of attorney and represent you fairly and aggressively. Some people are under the assumption that only a Phoenix AZ IRS tax attorney can represent you. Although they can assist you; its equally important to know that there may be a better alternative. Scott Allen as an Enrolled Agent is specifically licensed and regulated by Circular 230 which grants him the ability to represent taxpayers before the IRS in matter of collections and audits. It also licenses him to be a tax preparation professional and holds him to the highest standard of care for his clients. This is all that Scott Allen EA does and this is what he would like to do for you. Be sure the person you hire has experience in dealing with the IRS on a daily basis and doesn’t just do this work part time. To be effective in keeping up with the latest trends and intricacies its necessary to be “all in” on IRS back tax problem work. To read up more on the process or about Scott Allen EA view other areas of his website. Another accomplishment by Scott Allen EA. Myra had a handful of unfiled tax returns that she did not file. Several years ago the IRS caught that and filed substitute returns in her behalf. As you can see if you view the letter below…their number was much higher then our number. 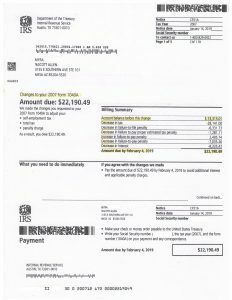 This is why its important to do a complete overview of anyone’s IRS account before filing any tax returns or negotiating any settlements. 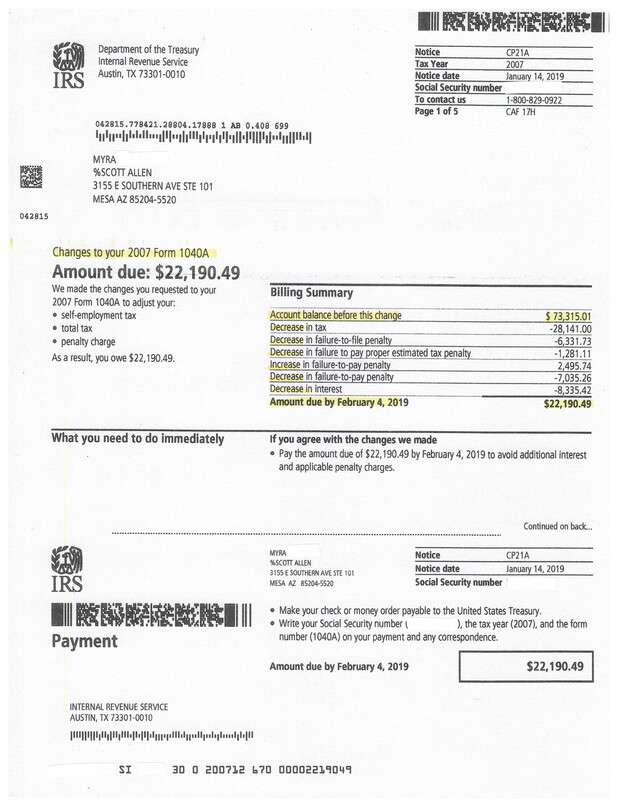 By preparing a corrected and accurate tax return the taxpayers saved over $50,000 in taxes, interest, and penalties. WOW! Most people are under the assumption that only an attorney can do this or fix that. That is not the case. Myra hired an Enrolled Agent by the name of Scott Allen. He was her IRS power of attorney and handled all tax matters for her. Stop delaying and call to speak with him today about your IRS nightmare.